The Great Monkey Rescue: Saving the Golden Lion Tamarins by Sandra Markle. Grades 3-5. Millbrook Press, October 2015. 40 pages. Review copy provided by my local library. Okay, so first of all, how cute is this monkey? This beautiful monkey is a golden lion tamarin and it’s sad to say that it’s an endangered species. Due to deforestation - the cutting down of trees in the tamarin’s home in Brazil - this species was in danger of becoming extinct. 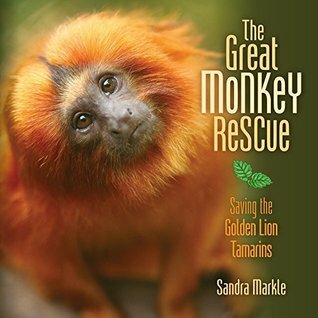 This nonfiction book tells the true story of the scientists who helped bring the golden lion tamarins back from the edge of extinction. And they did it by building a tree highway to help the tamarins reach protected habitats. You see, for the tamarins to survive in the wild, they need a large territory so they can find enough food during the dry seasons. The forests in which the tamarins can live are now separated by large pieces of land that have been cleared so cattle can graze there. The tamarins would not cross the open land to get to the next piece of forest. Even birds would not fly over the cleared area to travel from one forest area from another. So scientists came up with the idea of making a special highway for the animals: a highway made of trees that connects the areas of the forest where tamarins can make their home. To see how they did it and the other work scientists have done to save this cutest of monkeys, pick up The Great Monkey Rescue. My thoughts: I have really loved Sandra Markle's science mystery titles (including The Case of the Vanishing Golden Frogs and others) and this one is also awesome. The books read a little bit like the Scientists in the Field series (which I also love) in that you accompany scientists attempting to help an endangered species and see what work and investigation goes into it. The reading levels are a little easier and the books are shorter while still including lovely full-color photographs. I think it's a little easier to find a readership for Sandra Markle's titles because of these formatting choices. This particular title is so adorable that I knew I had to add it into my booktalking rotation and kids are going to be clamoring for it. I mean, look at that gorgeous monkey! How can you not want to know what's happening to him? This book is a great one to suggest to teachers doing lessons about nonfiction text features since it incorporates photo captions, maps, and sidebars. Back matter includes an author's note, a timeline, a glossary, a list of further resources, and an index. Readers who are ready for more of a challenge may enjoy some of the Scientists in the Field books. Try one of my favorites, Kakapo Rescue: Saving the World's Strangest Parrot by Sy Montgomery.